Ed Tech/Web 2.0 Tools for Educators and Students: Create a virtual cork board/sticky note page for K-8 students. Create a virtual cork board/sticky note page for K-8 students. Virtual cork boards and sticky note web pages are starting to become a pretty big hit for educators. For those who have never heard of such a thing it is simply this: You create a place (in seconds) where you, your students, colleagues, and parents can post information. Most of them can be private or public. Most of them can be embeded into other websites and blogs. Posting is in real time so as soon as a student posts it shows up on your pages. Some allow you to moderate your posts so that you can verify that they are appropriate before they go live. What are the advantages and/or purpose of using one? you might ask. Well, many of you might be using KWL charts in the front of the classroom, this could be an alternative. Have you ever given a sticky note to all your students, had them write some information on the note and then post it in some location in the classroom? If this is you and the mess, time, and organization of it makes it seem like such things aren't worth doing, then using a virtual cork board/sticky note might be a cool and unique way for students to virtually interact with the lesson. I have listed on my web 2.0 page, a list of several different sites worth taking a look at that allow you in minutes to create a virtually cork board. The one I would like to highlight today is called, "PrimaryWall." 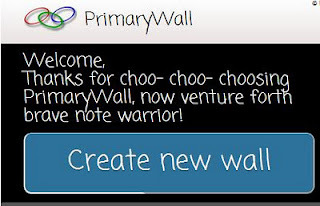 What can you do with PrimaryWall? Create an unlimited amount of notes to post on the wall. Change the background to multiple templates. Set passwords to the wall so that only members of your class can access it. You can set the name of the link. 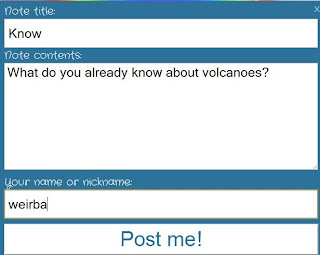 Your students can view the notes and ask questions at a later time. What are some disadvantages to using PrimaryWall? It won't let me add my own background. 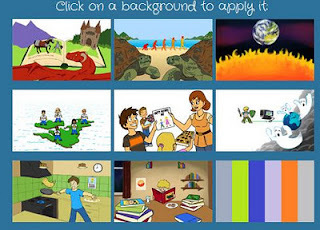 Some sites allow for videos and images to be posted. This site does not, at least as of today it doesn't. 2. If you want to change the background and have the ability to name your links you should register. The cool thing is that you don't have to have your students register to use the wall. 3. Once you have registered and received an email with a verification link, you will get an opportunity to create a password for your wall. 4. Once you are ready you can click the "Create new wall" button to get started. 5. At the top right you will see your setting options. Click on the background to change it. 6. 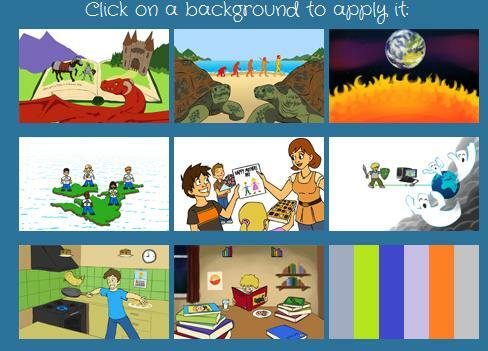 Here are the different background to choose from. 7. The font setting allows you to change your text to these font styles. 8. The security settings allow you to decide who gets to see your wall. I would just keep it to everybody. This way they don't have to login to interact with your wall. I would never put personal information on a public site anyway so I wouldn't care if everybody saw an educational wall. Not to mention somebody just surfing the web could win the lottery if they could accidentally find your particular wall. 9. Notice by the way that after you create a wall you will see the address to your particular wall in the address bar. This is one way to share it with everybody. 10. The "share" setting will give you a shortened, random link to your wall. I would prefer using the one I mentioned above. If you would like to embed your wall into a website you can copy the embed code here as well. 11. Click the "Add a Note" button to start adding notes to your wall. 12. Just fill in the information you want posted. 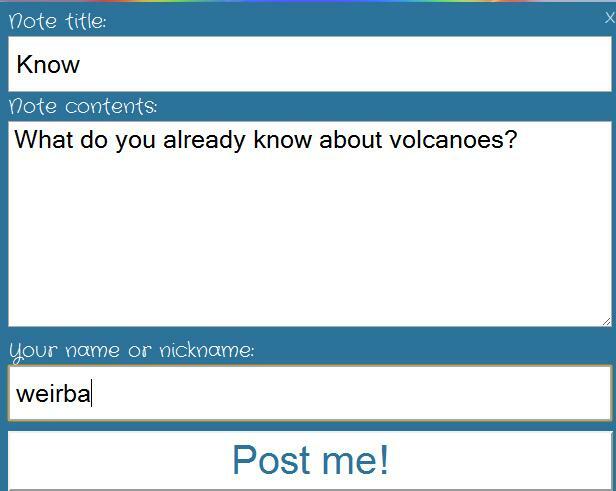 "Your name or nickname" is where your students when they add a note put their name, so that you can see who has participated. They can leave it blank if you don't mind the note being anonymous. 13. When you are done setting up your wall give the link to your students so that they can get to your wall and have them start answering questions. Below is a graphic that lets you kind of see what a wall could look like. Well you are on your way to creating possibly your first virtual cork board/post it note wall.